Its a champion in the featherweight category and note 3 is the reigning heavyweight chamipon of the world. G2 is a jewel in hands...I don't own a g2 but have used it. Its clearly better than S4 (not by big margin) but allround good enough to get phone of the year title. note 3 is phablet....too big to fit in smartphone category. and rest of the phones with smaller screen size might not be the most powerful topdogs out there but they are certainly smooth in performance. If you seems to like a phone that only can be used comfortably with both hands, then you would like a phablet size screen. For me the iphone screen is the best. I can live with a little less resolution, but being able to use it with just one hand. And also fits a lot easier in a jeans pocket! I would a like an android alternative the same size, but there is none! At this size only you get entry level androids. Why?????? I'm not saying this makes any of them better than the others, I just thought it would make for a nice comparison. Obviously, with people's different opinions on what is more important in a phone, you could rate the results based on that and get completely different conclusions, for example, a person may want a camera they can use on nights out without bringing an extra device (an actual camera) or a person may use their phone to listen to a lot of music, or a person may not be able to live without certain apps. Really this just means that which of these phones is better is a purely subjective decision. SPECS and PRICE wise, its the monster G2! Nice comparison guys. Looks like G2 is the best of three. Great phone G2 but I'm still waiting for iPhone 5s vs Galaxy Note 3 comparison. That's like apple vs oranges but would worth nonethless. Note 3 and not G2 is the best android smartphone on planet. Those who say it's another species, different from a regular phone, a phablet, can buy iPhone. Lol. Glad I have my optimus G. I like the G2 looks super sexc but need to play with it in store before committing. AnonD-45523, 09 Oct 2013finally love to see the LG g2 stealing the crown from galaxy S4.... lg came second last year ... moredon't want to sound biased, but the GS4, with it's slower chipset is still a better phone than the LG G2. The software is still a miss on the G2. 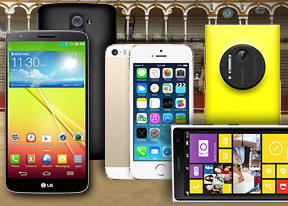 They should have picked either the S4, Note3 or Xperia Z1 to represent Android in this Compo. It is as if the G2 was the only available Snapdragon 800 powerhouse at the time, so they went with it. The LG G2 just misses the mark where it matters. I believe the Z1 or the Note 3 is the best android smartphone to date. I held the G2 in my hands, looks cheap and the awkwardly placed button on its back is just a killer (literally). Black Adder, 09 Oct 2013bitten apple`s formula is simple: half the pixels on a display can run the same fps with half ... moreAnyone stopping Samsung, LG, Sony, Nokia, etc for not selling/manufacturing similar spec phone as iPhone to show world see in benchmark we are best? AnonD-80609, 09 Oct 2013Dude, iphone is iphone with or without 1080p or 720p. But its not the same with windows. &... moreDisagree here. 1020 not offers only best camera but also great audio output, Video viewing also pleasure on that AMOLED screen. And great sound captured while Video capturing. Also yes it bit overpriced IMHO but overall package is good. AnonD-113843, 09 Oct 2013fails? ok fails....what that deep is? is there any deeper? can you mention that? chipset? ram?... moreZ1 is indeed a really nice phone (hardware and software wise). Things that I don't really like from Z1 is the big and angular form factor which makes it uncomfortable if you put it in your pocket. Thats why I prefer the G2 over it. And also the battery life is better on the G2. I really like the design of the Z1 though (its very beautiful design and arguably the best android device looks by far), all they need to do is make it in a lil bit smaller form factor (maybe they can reduce the bezel just like the G2).